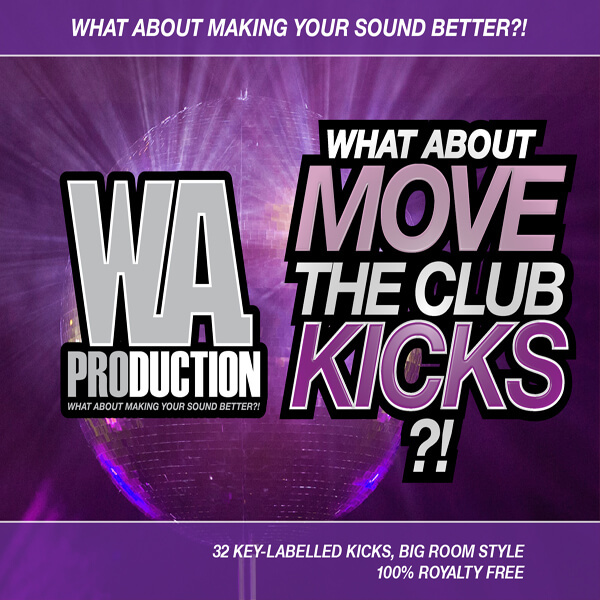 ‘What About: Move The Club Kicks’ is a killer new pack from W. A. Production, that includes 32 of the biggest key-labelled kicks with an awesome punch/clip and a precision sub bass. These Big Room style kicks will make your drops completely breath-taking beacuse their fatness is made by hardware compressors and equalisers, unlike the other “software made” samples. Get ready for the greatest-sounding kicks. ‘What About: Move The Club Kicks’ contains 32 samples that are tuned through a wide range of a musical scales, that means, that you don’t have to change the key of your banger. If you are looking for a massive kick, you just pick a sample in the key which you are looking for. Let’s move the club with your vibes!